Just released for iPhone and iPad, Ragdoll Blaster 3 is a great game that follows well in the footsteps of the other Ragdoll Blaster games. That having been said, I think this new version of their game will soon overshadow what started out as a simple game consisting of shooting a ragdoll out of a canon to hit a target. Don’t get me wrong, I love the older versions. However, this newest version of the game offers so much more. The first thing that I noticed when I launched the game, was the improvements that have been made in the graphics. The ragdolls, levels, and menus are now more brightly colored. They are almost cartoon-like, which immediately catches your attention. These graphics are a great improvement over the earlier versions of Ragdoll Blaster. When you first launch the game, you are shown a quick video of the ragdolls studying blueprints for a blimp they want to build to go on a trip. 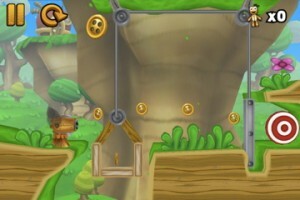 However, in order to complete this task, you must first complete the levels in the first of five worlds. As you might expect, in the first few levels you are given hints to help you learn to play the game, should you have missed out on Ragdoll Blaster 1 & 2. At the end of each completed level, you get a piece of the blueprints for the blimp. I am not really sure what the correlation is there, but found that it didn’t really matter. After finishing all the levels, your blimp is complete and the ragdolls can fly away. As you proceed through each of the worlds, the pattern is much the same. Another big difference between Ragdoll Blaster 3 and the earlier two versions of the game, is the ability to buy upgrades. There are two ways to do this. 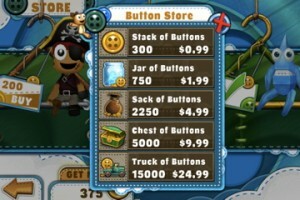 First, each level has golden buttons in it. 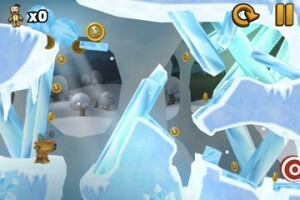 As you play the levels, you can collect the buttons by hitting them. Collect enough buttons and you can upgrade your ragdoll to one that is wearing a different costume. This feature is amusing, however, you should know that these are merely costume upgrades. The new ragdolls don’t hold any special powers. There are upgrades that you can buy that do give you extra help. 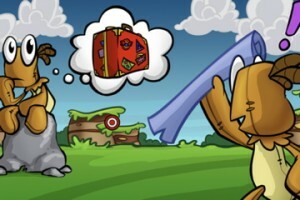 Unfortunately, these are In-App Purchases and cost real money. 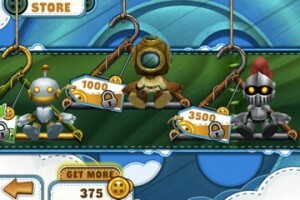 You can buy anything from extra buttons and hints for levels to a rocket ragdoll that will solve any level. Personally, I like to complete puzzles and games on my own, but for those who want or need more help, it is there for you. Many of these levels are quite tricky. I think my favorite feature of the game is that it was constantly changing. Each world is different with a different type of ragdoll. The challenges that each level presents are unique. Just when you think you have things figured out, the game throws you for a loop, literally. Ragdoll Blaster 3 is a well-designed and polished game that provides enough variety and challenge to keep you going for hours.